The disease proved deadly because of the unsanitary conditions prevailing in the town of St. George. As the days went by the number of fatalities increased. With the lack of adequate medical services, the disease spread unimpeded throughout the island and to the Grenadines, exacting a heavy toll. A major effort to contain the disease failed due to the shortage of medical supplies and personnel, some of whom were requested from neighbouring islands. The military barracks under Fort George (later the GeneralHospital) was temporarily converted to a quarantine facility in an attempt to contain the disease. From June to September cholera raged throughout the islands, ravaging the population and killing at least 11 per cent, many from St. Patrick (1,363) and St. George (682). 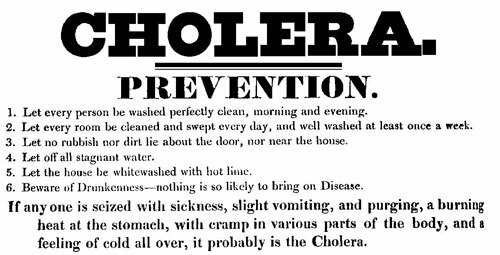 The cholera epidemic struck many islands in the West Indies leaving 20,000 dead in Barbados and 30,000 in Jamaica. It prompted the Grenada government to pass legislation providing each parish with medical personnel and to improve sanitary conditions in the towns. by John Angus, Martin, curator of the Grenada National Museum.